When it launched in 2005, the Doctor of Nursing Practice program at GRU’s College of Nursing was one of few in the nation—and hasn’t stopped innovating yet. Many people dream about becoming nurses. But not Lindsay Moore. Moore didn’t even take any science classes during her time at Georgia’s Toccoa Falls College, instead double majoring in business administration and counseling with a double minor in outdoor leadership and education and Biblical studies. Her heart was for mission work, but hearts can be funny things. After college graduation, she worked for a relief organization in Gabon, Africa, alongside physicians and advanced practice nurses, and suddenly her heart changed. “We had a lot of good conversations about what they do, and nursing just seemed to fit,” said Moore. But then there were those science classes—and the fact that Moore was eager to get back to the mission field as a nurse, not in 10 or more years but as soon as possible. All of which brought her back to Georgia and to the Georgia Regents University College of Nursing. GRU offers an accelerated 16-month Clinical Nurse Leader program designed specifically for professionals interested in nursing, but who, like Moore, earned their degree in another field. While Moore still had to brush up on a few prerequisite classes in chemistry and biology, she was accepted and enrolled in the CNL program in 2010. But Moore was looking beyond that. Her ultimate goal was to then enter GRU’s Doctor of Nursing Practice program and its acute care nurse practitioner option immediately after graduating as a CNL. Moore in fact would become the first GRU nursing student to go straight through from the CNL to the DNP program—heralding a sea change in how nursing education is being delivered at GRU and serving as a model for other nursing programs who are watching GRU’s innovations closely. This year marks the 10th anniversary of the College of Nursing’s DNP program—which was one of just 10 in the nation when it launched in the summer of 2005. For nursing dean Dr. Lucy Marion, launching the program was a prerequisite of her accepting the dean’s position at GRU (then named the Medical College of Georgia). “We knew it was going to be the future,” said Marion. She recently had served as president of the National Organization of Nurse Practitioner Faculties, and the data crossing her desk revealed that nurse practitioner students were spending considerably more classroom and clinical hours to learn what they needed—approaching doctoral levels. “We saw that, and we said, ‘Something’s happening here,’” said Marion. That “something” was a knowledge explosion in health care due to a rapidly changing health care environment, coupled with a growing nationwide shortage of primary care physicians and limits to resident physician hours. Nurse practitioners had been stepping up to fill the gap, providing primary care and ensuring care coordination and patient education, all while still holding the patient’s hand during tough times. Marion left that meeting with a commitment by the organization to support the development of DNP programs for advanced practice nurses—and three years later she was laying the groundwork for a new DNP program at GRU. The program was launched after just nine months of planning under the leadership of Dr. Sandy Turner, FNP—“It was rough, very rough, but we pushed it through,” said Marion—with a first class made up entirely of GRU nursing faculty members. Fourteen in all, with 11 graduating, they would serve as a test class to help improve and refine the program. The program has changed rapidly over the past decade. Originally simply a post-masters DNP, acute care nurse practitioner was the first concentration added to the degree, followed by family nurse practitioner and pediatric nurse practitioner. By fall 2016, the plan is to add mental health, nurse anesthesia and nurse executive concentrations, and later, public health. The DNP candidates get an early taste of how they can make a real difference—or as Murphy describes it, “have an equal seat at the table.” Each candidate must complete a final project, which gave Murphy, as a student, the opportunity to work alongside national nursing leaders to develop a multidisciplinary evidence-based guideline to prevent post-operative nausea and vomiting, while Moore proved the effectiveness of video discharge instructions for sickle cell patients—a program that is now being adopted in that clinic and others at GRHealth. Marion’s prediction of DNP programs “happening big” was accurate. Today there are more than 250 DNP programs nationwide—and GRU’s program alone has graduated 143 DNPs since its inception, with another 10 expected this May. But the program isn’t simply resting on its laurels. In 2010, the Institute of Medicine released a report—“The Future of Nursing: Leading Change, Advancing Health”—that, among other things, urged nursing schools to improve their educational systems so that nurses could achieve higher levels of training and education with seamless academic progression, not the least of which was to double the number of doctorally prepared nurses by 2020. The IOM recommendations were groundbreaking. Nursing culture has always dictated that becoming an advanced practice nurse required earning a degree, stopping to get two or more years of experience, then going back for another degree and so on. The result is that advanced practice nurses are often in their 40s or 50s before they earn a doctoral degree—in contrast to physicians and other health care providers—and miss out on years of productivity where they could have advanced the practice of nursing as DNPs. For Moore, who graduated in May 2014 and is now a nationally certified Adult and Geriatric Acute Care Nurse Practitioner, her four years of study were challenging, informative, exhilarating and enlightening. During her DNP program, she worked as an ER nurse and is continuing to do so as a nurse practitioner, all while pursuing an international medicine fellowship before she returns to the mission field. “I wouldn’t have done it any other way,” she said. The Georgia Regents University College of Nursing has launched two new Doctor of Nursing Practice degrees to prepare family and pediatric nurse practitioners, becoming one of the first nursing schools in Georgia to offer doctoral degrees in those fields. The programs will begin in the fall. The programs will accept students with bachelor’s or master’s of science degrees in nursing. Students who have a bachelor’s degree can complete the program in three years with full-time study and can work part-time during their first year to gain clinical experience. Other students have tailored programs of study. The university’s original post-masters, traditional DNP program was the first in Georgia and most of the 106 graduates remain in the state. GRU has offered a DNP degree for acute care nurse practitioners since 2010, the first doctoral degree of its kind in Georgia. Previously, the family and pediatric programs were offered at the master’s degree level, but are expected to be phased out. The new DNP doctoral programs will educate nurse practitioners in evidence-based practice, requiring them to consider whether certain types of care lead to the best healthcare outcomes. They will learn to provide evidence that a health problem exists, identify factors contributing to the problem and then review research to find the best solution to address the problem. Because so much new information is available, nurse practitioners must be able to evaluate it and make changes in their practices accordingly, Murphy said. 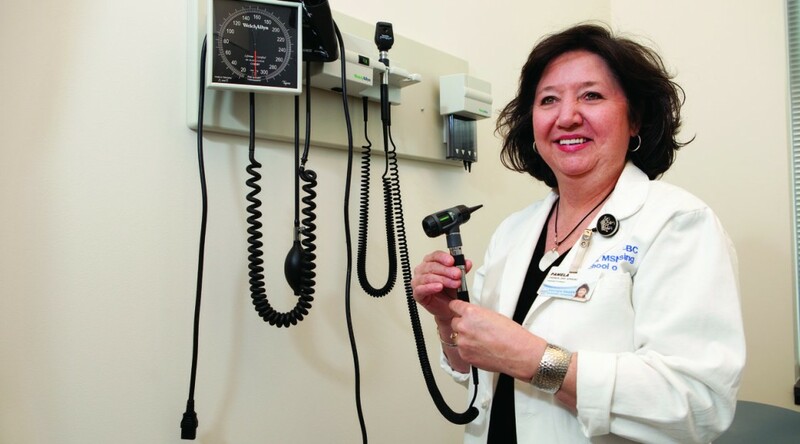 “Master prepared nurse practitioners have excellent outcomes, but as we move forward in this ever changing healthcare environment, they’re going to have to have some additional tools to help them function in this environment effectively,” she said. For more information, visit http://www.georgiahealth.edu/nursing/dnp_programs.html.